There are many race reports out there so I will share with you my point of view. 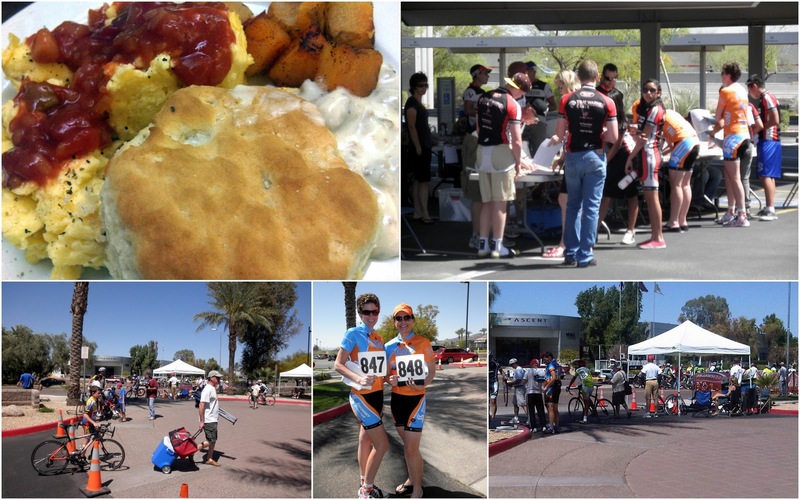 Down the road racing may lose its novelty but for now, I'd like to share the exciting race day (and weekend) I had with the women of Team Fluid Cycling. Waking up at 7:30 a.m. on Sunday was, for me, sleeping in compared to the morning before when I rose at 4:30 a.m. to load my bike and luggage in the car and met my teammates for the road trip to Mesa, Arizona. After a long day of racing on Saturday and dinner at a Mexican restaurant (La Parilla Suiza), we fell easily in to a slumber at our room. One by one we shuffled to the hotel lobby for breakfast, each with laptop tucked underneath our arms. While June and Monique caught up on work, Melinda listened to music, and I blogged. Ever present were our cups of coffee, our libation of choice. Scrambled eggs, biscuits and gravy, hash browns, cereal, pastries, juices, and fresh fruit was available for us to eat. We could even make ourselves fresh waffles! Of course I usually prefer savory over sweet for breakfast unless there's pancakes! When we were fed and happy, we sauntered back to our room and packed our bags. The start of our race would not be until 1:45 p.m. so it was nice to have leisure time to relax and enjoy the rest of our morning. Finally after our luggage and bikes loaded up, we drove to the race location in Phoenix, AZ and walked to the pre-race check in. Then we pinned our numbers on to our jerseys and mounted our bikes on the trainers so we can pedal until we were hot, sweaty, and ready to hit the line for the 30 minute race. I had heard that the race time dictates the speed of the race. If the duration is longer, the average pace may be slower with periods of high intensity followed by recovery like yesterday's race which was 40 minutes. Today's race is shorter so there's less time to recover before the speed cranks up and the combined field of Women Cat 1, 2, 3, and 4 means everyone else has more racing experience and are most likely stronger and faster. In other words, the race and competition are harder. Where yesterday's crit consisted of Women Cat 3, 4, 35+, and 50+ (and don't get me wrong, there were plenty of strong, fast women and typically, they are in the 35+ and 50+ age group). Note: the progression from beginner to advanced racers in the women's category is 4, 3, 2, 1, Pro and there are also age groups (the men's ranking starts with Cat 5.) For example, a Cat 2 who is over the age of 35 can choose to race in his/her category and also the age group category. 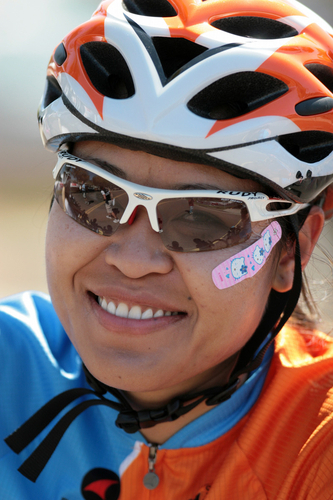 Fifteen women from all categories steadied their wheels at the start line. The officials decided that even though we would race together, the Women Cat 1/2 would be scored separately from the Women Cat 3/4 which is a good thing and so we would have separate placings rather than combined. This time I didn't feel the hot flash of adrenaline vaporize from my body out of nervousness and excitement. I only wanted to finish the race, stay upright, and avoid the same unfortunate event as yesterday. It would surely ruin my weekend if I crashed again. The race official counted down 5...4...3...2...1...GO and like the firing of cannons, we shot off the start line. Judging by the rate of our pace you would think there was a prime (or prize) at the end of the the first lap--a date with pro bicycle racer Fabian Cancellara or something. I hammered on my pedals to keep up so I wouldn't get dropped on the first lap. From behind me my teammate shouted, 'Don't blow up trying to hang on to the Cat 1/2 women' who were leading the pack. After the first lap the pace slowed down somewhat. I honestly cannot remember much about the 30 minutes I was out there. Everything was sort of a blur...I remember I was suffering but hung with the group until the last 7 or 6 laps. The course was a triangle, with two left hand turns and we pedaled around and around and around. The front of the pack would surge after an attack to reel in the women who made a breakaway before the pace slowed down so everyone can recover. During this time I was like the tentacles on a jellyfish, springing up to the pack when they slowed down and stretching away when they surged. I think I got comfortable knowing that the group would slow down and I'd catch up. Somewhere along the way I lost focus that I was competing in a race--a short race at that (even though every minute felt like a long time) and there was no room to space off. I also remember being mesmerized by the wheels spinning in front of my own and wondering if my tire will go flat each time I hit a bump in a turn. Finally, I gave it my all to seek shelter near the front of the group, passing my teammate but shortly thereafter someone launched another attack and the whirring of wheels ensued. June, my teammate sprinted past me as the pack slipped around the corner and everything faded away. 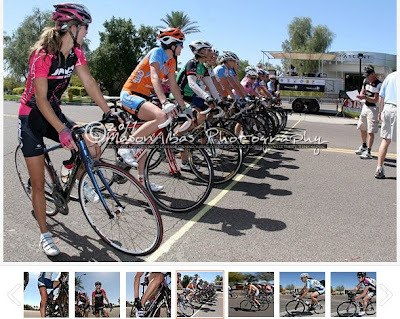 Before I knew it, I was off the back with two other women who I formed a paceline with. My lungs and legs were getting more and more exhausted and when I couldn't keep up with them, I fell behind and they rode ahead. Still I kept pushing on the pedal even though I was alone for the last five laps and in the last round, one of the women caught up to me. "I guess it's just you and me." she gasped through her smile and pulled ahead. I rode in her slipstream until we made the last turn and saw the finish line. She started sprinting while I stayed in my saddle, keeping my position beside her. When she started to let up I stood up and sprinted across the finish line. I heard the announcer call out my number as I passed by but had no clue where I placed. Turned out she was a Cat 1/2 so I did not move ahead in my category. Relief swept over me as I circled around the lap one last time. The race and suffering was finally over. When the results posted, my teammate June secured 3rd, I took 7th followed by Monique in 8th, and Melinda in 9th of the Cat 3/4. Now we can finally head home! Similar to the way we came, we followed each other in our cars during the five hour drive towards Vegas stopping at Jersey Mike's Subs for a late lunch before we were on our way. I experienced one of the best weekends of racing with my teammates, getting to know them on a personal level, and enjoying the gorgeous weather in Arizona. Even though I stepped foot at home tired and achy from the weekend, there is not one thing I would change about my adventure. Meanwhile John, who had been racing another state away in San Dimas, CA since Thursday, drove in several hours before me. The San Dimas Stage Race is a huge event, drawing in professional teams and competitors from all over the country. The three-day stage race began with a time trial and 120 riders in his category. He placed 18th in the time trial which was 3.8 miles of climbing 4.5 to 5.5% grade (twisted and steep road pictured to the right), 10th in the 42-mile road race, and took 4th in the sprint finish of the 35-minute criterium (average speed of winner was 25.67mph--that's fast). Many of the Cat 4 men either didn't make the time cut or for whatever reason could not continue the next day's race so only 66 would finish. John placed 16th out of the 100+ riders, only 50 seconds behind the overall winner of the weekend's event. I am so proud of him!!! Both of you did well! Good work!